Brighton Work Group: Meets 3rd Wednesday of the month 9:00 am to 2:30 pm Meets at Seventh-day Adventist Church, 567 Bromley Lane, Brighton; Contact Carol: chesneyc@aol.com. Bring a dish to share at our potluck at noon. The Brighton work group started in the summer of 1998 at Victoria Swain’s home. The first meeting had 3-4 members. We moved to a small room off the sanctuary of St. Elizabeth’s Episcopal church in the fall of 1998. We had one table that we used for sewing and put things away for our potluck at noon then got it back out after lunch. We then moved to the present location at the 7th day Adventist church. We advertised in the local paper and Pastor Bell and his wife Ginger invited us to use the fellowship hall. They have been strong supporters of what we do since that time. The Brighton WHWB baby house has moved numerous times with the help of several volunteers. We started out with large totes at Victoria’s house and storing the overflow in a camper. 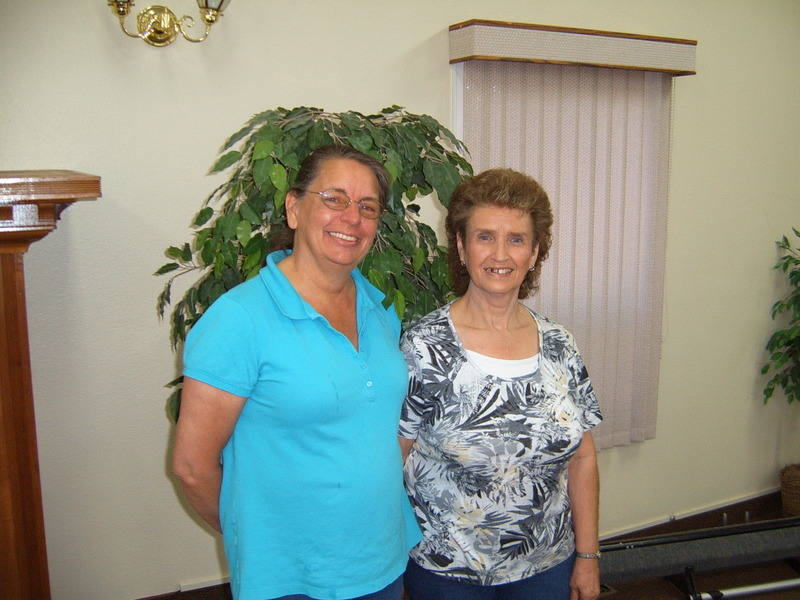 Dolores Bohlmeyer helped with renting us a storage unit until we moved to the trailer on Riverdale road. When we were asked to leave … we rented three large storage units for the summer before moving to the basement of a downtown business. We had fun times being the bag ladies of Brighton hauling everything down Main Street down a steep flight of stairs to the small storage room. When we decided that we were getting too old for this, we rented a studio apartment for a few years. We were lucky for a few months to rent a 3 bedroom house but had to move as the owner’s needed it for a family member. We then rented the trailer in Brighton until we passed the baby house torch to Arvada in 2012. We have been fortunate over the years to have people step up to help when needed. Patty Lawlor came every week from Thornton to help at the trailer. Karyl and Fred Fredrekisen help with the deliveries. Many of our ladies have been coming for years and help with recruiting volunteers, lunch cleanup and sorting donations. We have had great dedicated volunteers that help with instructing newcomers and picking up the slack when Nancy and I are busy. They all come with smiles, stories to share, wonderful dishes with the recipes for the food they make. Over the years, Carol’s husband Cris has helped with a wide variety of projects like moving the Baby House and transporting items for an annual garage sale. Nancy has the honor of delivering layettes and quilts to Platte Valley Medical Center. They really appreciate all the hard work everyone puts into the clothes. It is so nice to hear from them how the recipients love them. They think it is so special that someone gives clothes to their newborns at no charge. Carol and Nancy deliver to Inner City and Bright Beginnings in Denver and the Denver Hospice along with many more agencies. In Nancy’s words “Carol seems to think that since I don’t drive in Denver she can take me the back roads to getting where we need to go. If she would ever leave me there, I wouldn’t have any idea where I was or how I would get home. “”Ha Ha” . We deliver to agencies in Weld County and provide supplies to Loveland. Carol also does presentations to groups interested in learning what WHWB does.Nancy’ husband Fred does a lot of the heavy lifting needed to handle gently used clothing from Joonbugz in Brighton and from Tantrums in Colorado Springs. Nancy separates the clothes and counts them to get ready for delivery. Every month, Glenda and Theron Bredeson pickup our delivery for the Baby House in Arvada and various organizations in Denver. A BIG THANK YOU to all members of the Brighton Work Group!! !